Valentine Decorations for the Home — Find fun and easy ideas to make your Valentine’s day a special one with tips for the table, lighting, decorating banisters, chairs and more. Spruce up the home with fun and easy ideas for valentine table decorations, valentine day light decorations and more! Whether you are hosting a Valentine’s day party, or just want to enjoy the holiday, find creative ideas with photos to make your Valentine’s Day decor a hit. After taking down the Christmas decorations, the house can feel and look quite blah. Sprucing up the home with Valentine’s Day decorations will keep the holiday spirit going as we move on to the holiday of love. With these ideas for valentine table decorations and lights, your home will feel cozy again in no time. Before decorating, it is important to know your own decorating style or the style of your house and decor. This will help you in your purchasing decisions for style and color. Traditional Valentine colors of red, white and pink are shown here. Using a barrel or an accent glass top table, place the valentine day lights underneath the glass. For an added effect, add some beads for some shine. Finish the table off with a few small decorations or candles. Other ideas for using Valentine light decorations are to lay them on the top of a hutch or small table with beads surrounding them. These Valentine’s day light decorations are available at Target. Online they are priced much higher than in the local store. These were purchased at $2.50 and online they are quoted as at least $12.99. These, available in pink hearts, can also be used in red, or with other shapes and sizes. Next, let’s consider valentine table decorations. These do not have to be expensive to provide a dramatic effect. Purchase a cloth valentine tablecloth; red and white gingham will also work well. The one shown was purchased from JOANN Fabric & Craft Stores. 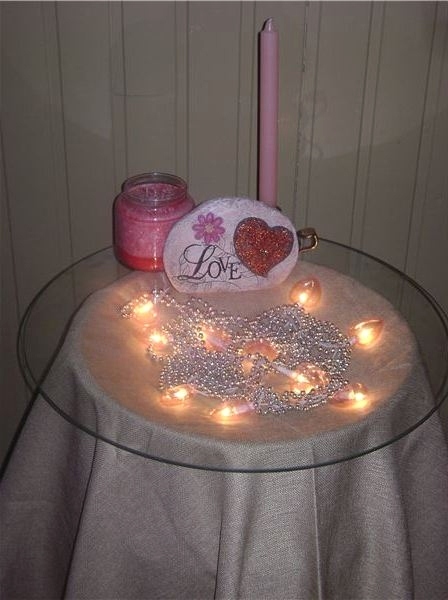 Add some plastic flutes (purchased from the Dollar Tree), white plates, heart beads (purchased at Target) and a few candles surrounded by red rocks, and you have an elegant and fun table for Valentine’s Day. For a very pretty table and to break up the red, layer the table with a white cloth. Don’t forget the chairs! Tie a long piece of tulle around the back of dining room chairs (not shown) to add a romantic feel to the room. Chairs can be embellished in many ways to add to the flair. Because Valentine’s Day is meant to be whimsical, consider decorating an antique chair with some bows and ribbons for that added touch of fun. For a kitchen table, consider making placemats by weaving strips of ribbon. Warning: this placemat is tedious to make and is not exactly inexpensive. You can learn to make this candle table decoration too! If you enjoy scrapbooking and have some materials in your theme colors available, trace some hearts using a cookie cutter. Staple the hearts to a long heavy felt ribbon (hopefully left from Christmas) and add a raffia bow at the end and create an easy banister decoration. The ribbon was tied with wire tie rather than tape to keep it sturdy. String heart beads from chandeliers for an elegant look, or a heart garden mobile for a country look. Add some pink or red throw rugs, candles and hand towels to the kitchen and bathroom. Add a pink or red runner to a television stand with a few candles. Make or buy a simple valentine day wreath for a door decoration.